Batur Ozan Togay in World Affairs on 20 December, 2016. 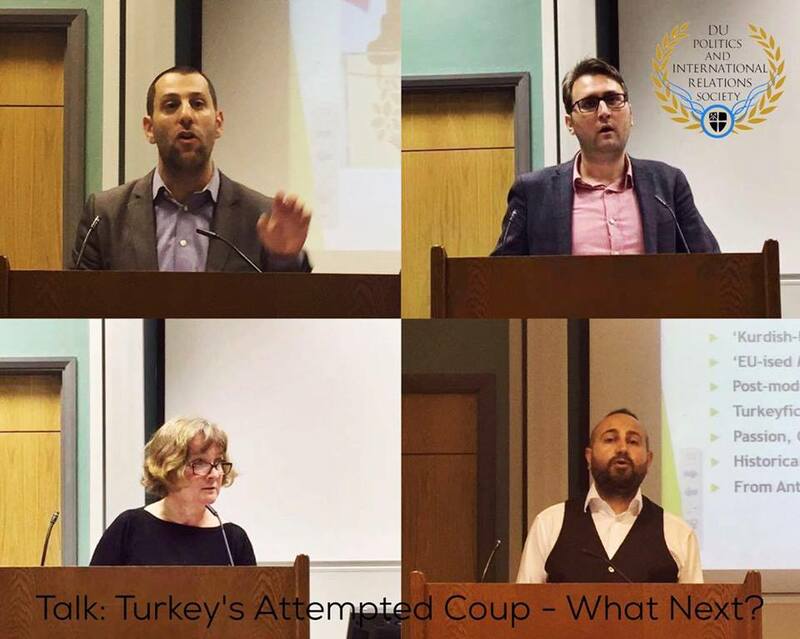 DU Politics and International Relations Society hosted Ms. Sara Whyatt, Mr. Emre Çalışkan, Dr. Simon Waldman, and Dr. Ömer Tekdemir to discuss the 2016 coup d’état attempt in Turkey. For him, the most important requirement of a state is to provide security for its citizens, yet Turkey has provided neither the protection of individual rights nor physical security (especially due to the perpetual terrorist attacks). Turkey also “lacks the ability to give basic services to its population” as a state with restricted rule of law, the lack of a constitutional system with checks and balances and personalities prevailing over institutions. Consequently, Dr. Waldman depicted Turkey as a country “not comfortable in its own skin”, reminding the audience of the imprisonment of intellectuals and journalists, along with the arguably more central issues, ranging from the “deep state” to the “parallel structure”. The “deep state” involved a network of state officials challenging the threats of fundamental Islam and Kurdish separatism. The “parallel structure”, on the other hand, is the Gülenist movement that has embedded itself within the institutions of the state, particularly the judiciary, police force, and military. According to Waldman, the sequential existence and influence of these two structures inside state institutions display the weakness of the state, which expresses loyalty to ideologies and spiritual leaders rather than the principles of democracy and justice. Dr. Waldman expanded on his argument by criticising the replacement of non-AKP officials following the purge against Gülenists, as new officials sharing the same ideology as the AKP had been taking their places. The speaker concluded with a statement that ideology and political affiliation surpassed merit in the state order. After mentioning issues such as the social media crackdowns, Dr. Waldman also touched upon the pro-Kurdish HDP leaders’ incarceration, which demonstrated the weakness of the state due to the government’s ability to influence and interfere in the judiciary’s decision-making process. Furthermore, the eradication of the constitution is the result of violation of presidential power and another indication of Turkey’s weakness as a state. A head of state must be a pillar of the constitution rather than act to undermine the document’s substance, stated the speaker. Before finalising his speech, Dr. Waldman spoke of the Turkish military’s condition, arguing that the military lost its operational capacity after the purge against Gülenists, especially with regards to the higher ranking military officials and the air force. His concluding remark was particularly interesting: Erdoğan is secure, yet Turkey is weak. 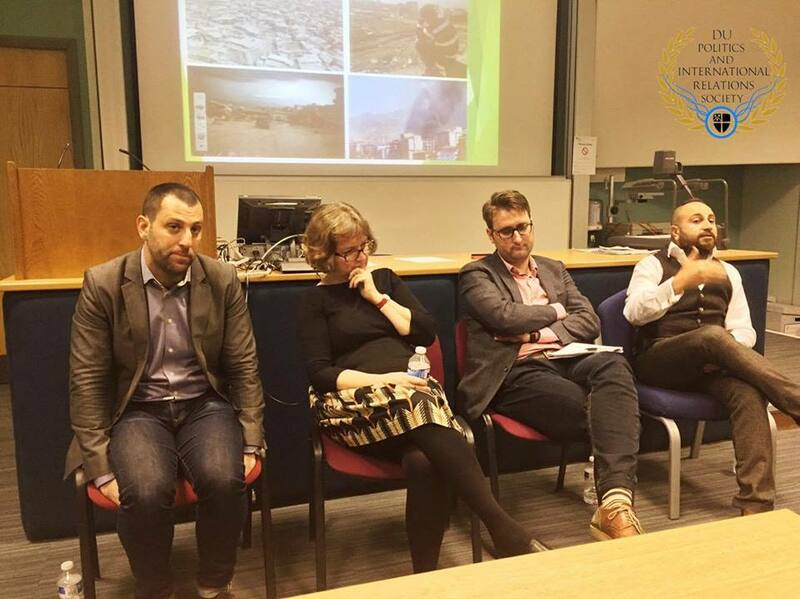 The final speaker, Dr. Ömer Tekdemir is a Durham University alumnus and Leicester University lecturer who carries out research on the Kurdish question. He took a specific focus on the Kurdish political movements. Dr. Tekdemir started his speech by announcing that he will “try to give another side of Turkey’s story”, presenting the division of recent Turkish history into two periods, with June 2015 general election as a turning point. Mr. Tekdemir explained how the ideological shift from independence to democratic autonomy occurred in Kurdish political movement. Starting from the capture of PKK leader Abdullah Öcalan in 1999, negotiations in Oslo with the PKK in 2009 and following the Turkish-Kurdish peace process of 2013- 2015, the speaker delineated the establishment of the Peoples’ Democratic Party as a move to rebrand the Kurdish political movement under a liberal and pluralist party. He identified the Kurdish political groups in Turkey as having three major players. Firstly, Kurdistan Workers’ Party (PKK), which the speaker described as “the hegemonic political agent”. Secondly, the pro-Kurdish political parties and NGOs, which include the Democratic Regions Party (DBP) and the Democratic Society Congress (DTK). Thirdly, the Kurdish-led, but “not pro-Kurdish” and the left-leaning, but “not left-wing” Peoples’ Democratic Party (HDP). The speaker drew his audience’s attention to the HDP’s understanding of “radical democracy”. It was explained using the framework of agonism by the political theorists Ernesto Laclau and Chantal Mouffe; the theory emphasises the potentially positive aspects of certain forms of political conflict. Aligned with Murray Bookchin’s theoretical framework of anarchism and libertarian socialism, it forms the radical democracy of the HDP.Dr. Tekdemir did not forget to mention The Kurdish Democratic Union Party (PYD) as a Syrian affiliate of the militant Kurdistan Workers’ Party. He distinguished the HDP’s approach from the PKK and PYD’s implementation in Syria, since HDP tried to carry out their “radical democracy” within the existing system in order to transform it. Dr. Tekdemir also claimed that the emergence of the HDP brought a completely new discourse, unknown to Turkish politics since the establishment of the republic. On the other hand, he defined the current period, starting with the June 2015 election in Turkish political history, as “post-democracy”, which became particualry prominent after the Gülenist coup attempt. This was done to argue that “representative politics of Turkish democracy is not working” and instead “it is in a state of organic crisis”. He further elucidated this point by explaining the dysfunction of both the centre-left People’s Republican Party (CHP) and centre-right Justice and Development Party (AKP) on the Kurdish question by likening their contrast to the differences between Coca Cola and Pepsi Cola. Dr. Tekdemir uses Antonio Gramsci’s arguments to explain the New Turkey’s organic crisis, which “consists precisely in the fact that the old is dying and the new cannot be born”. As a result of this interregnum, “a great variety of morbid symptoms appear” (Gramsci, 1971). This supports his suggestion that the HDP tried to be “the new”, but failed. In order to further underline the contrast between the Turkey and Syria’s Kurdish movements, the speaker went on to thoroughly unfold the HDP’s internal mechanism and balances and its historical position. In particular, the contrast was highlighted by describing regional differences in discourse, with a union of liberals, democrats, pluralists, leftists, Alevis, LGBTs in the West and pro-Kurdish base voters in the East. Tekdemir did this by explaining the PYD’s rejection of the Syrian state to implement its understanding of direct or even absolute democracy, and the HDP’s wish to engage in the existing political system in order to transform it into a radical democracy. The speaker also mentioned that Kurdish groups in Turkish districts such as Sur, Cizre and Şırnak adopted the revolutionary approach of the Syrian Kurds and demanded self-governance, claiming that the AKP could not see the distinction between these Kurdish groups and the HDP, therefore preventing the political activity of the HDP in Turkish politics. His conclusion stated that the HDP’s alternative politics (“passive revolution”) also challenged the PKK’s hegemony as well as the AKP. This conclusion was reinforced by reminding the audience of the attacks against the HDP, the dismissed mayors and co-mayors, suspended Alevi and Kurdish teachers, arrests of many prominent Kurdish politicians and the shutting down of pro-Kurdish or leftist media outlets during the state of emergency. Lastly, we proceeded to a panel discussion in which the audience questioned and commented on the presentations of our speakers. We addressed many of the previously analysed as well as unspecified topics such as the significance of ideology to comprehend the running of the Turkish state, the CHP’s outlook on the Kurdish issue, the HDP’s unclear or poorly represented image after the June 2015 election, the opposition parties’ influence and capabilities in the post-coup environment of a visibly more authoritarian Turkey, the background and nature of the relationship between the AKP and Gülenists, and Turkey’s current position within the NATO framework (particularly after the purge against Gülenists severely weakened its military). All in all, it was an outstandingly successful event in which the speakers had a solid platform to convey the core of their research and analysis of the Turkish political history. The audience had a unique chance to expand their knowledge on the contemporary history, social structure, international affairs, and domestic politics of Turkey.